This property has a great location and beautiful bay views. Plenty to enjoy when you are not enjoying the beach or the private pool! Located on the corner of Kabler and Sandpiper, to get to the beach you just cross the street and take the short jaunt down to the beach access. You have well maintained walkway to your private dock on a canal plus sunset bay views while enjoying an evening of drinks and family fun, or dining al fresco on one of the top two gazebo levels. Imagine the memories you will make at that private pool or during a family gathering set up in the lovely garden and gazebo area. The unique Top Master Suite offers extra privacy from the noise and hubbub of the main level. Ground level is a great spot for Grandparents or make it a Family Suite for young families with the privacy and additional Kitchenette with Full size refrigerator, sink and storage. Or you can use it for extra storage for fewer trips to the market! Bring or rent your kayaks to enjoy tranquil days on the bay (don’t forget the life jackets). Top-Level: King Master with Tile Shower, Walk-in Closet, LCD TV. Ground-Level: Rec Room with LCD TV, Air Hockey, Kitchenette with Bar seats 3, Full Size Refrigerator, Microwave, and Sink, Table seats 4, Hall Bathroom, King Bedroom with LCD TV; Bedroom with 2 Queens, Carport. 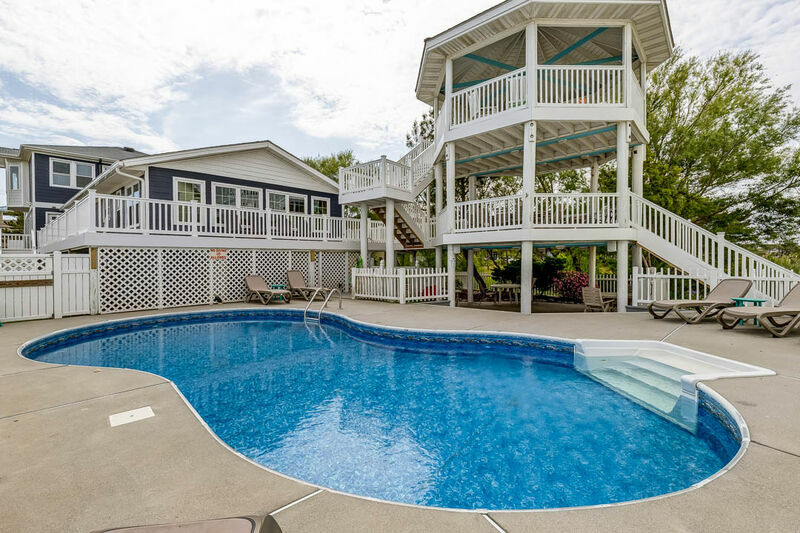 Extras: Private Pool Solar Heated(30 x 10), Wireless Internet Access, DVD player, Air Hockey, 2 Full Size Refrigerators, 2 Microwaves, Gas Grill, Private Dock, No Smoking, PETS NOT ALLOWED, Parking: 6 Cars, Distance to the Beach: 492 ft.